Check out Fort Lauderdale catcher Mark Theil, moments after he ate everything in the ballpark. What choppers! 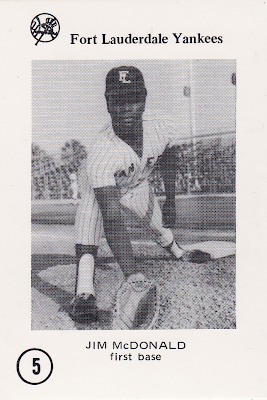 1970s collector and Florida-based baseball writer Neil Sussman published these sets of local single-A teams, some for the Fort Lauderdale Yankees and others for the West Palm Beach Expos (profile to come). 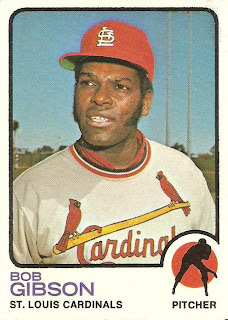 While their design lacks Topps-level detailing, just about any mid-70s minor league set offers a rare glimpse of players and ballparks long since retired. 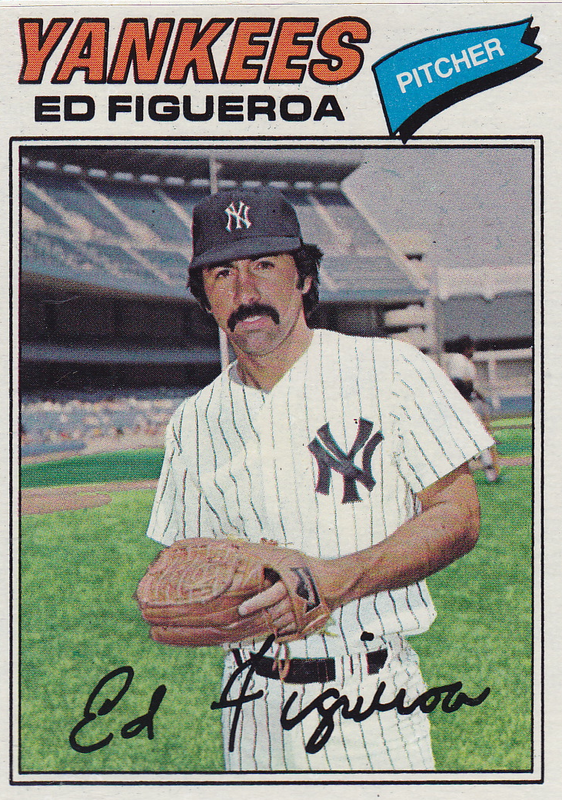 Keith Olbermann's 2010 seasonal wrap-up, Expectations and More Minor Leaguers, showed Theil's teammate and future MLB manager Doug Melvin on a Sussman card, sporting the best monobrow since Wally Moon. His article also features Moneyball leading man Billy Beane in Portland Beaver gear. The 2011 movie stars Brad Pitt as Beane, a pretty decent visual match. Anyone you'd have cast instead? Scott Bakula circa 1990? Value: This #5 cost $3 at MinorLeagueSingles.com, about what other mid-70s players go for. Fort Lauderdale played in the single-A Florida State League, which now comprises 12 teams. They're split between "North" and "South" divisions, but most play the state's peninsula (instead of its panhandle). 15 big league franchises hold spring training in Florida; the other 15 go to Arizona's Cactus League. The minor leagues aren't all about grooming high-round draft picks; many teams place equal emphasis on developing their trainers and coaching staffs. Several of Fort Lauderdale's managers, for example, went on to play important roles for their parent club. Value: Today's #5 cost $3 at MinorLeagueSingles.com. Willie Upshaw's the best known player from its checklist and would run a little more. Fakes / reprints: Haven't seen any in the market, though they'd be easy to reprint with modern equipment. 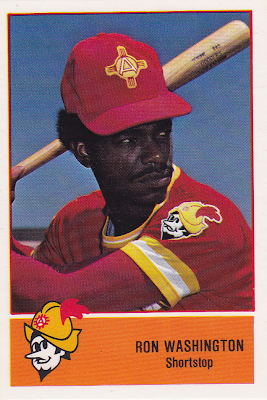 Congratulations to 2011 AL West winners Texas, who wrapped up their second straight crown under the tutelage of one Ron Washington, current manager and former shortstop for the Dukes of Albuquerque. In Keith Olbermann's tradition of posting cards for MLB managers as minor leaguers, here's a "serious face" shot from Ron's salad days. 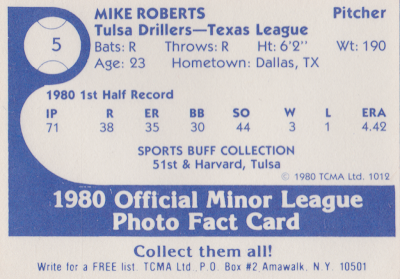 Cramer printed most of their minor league teams on thin, white cardboard that's reminiscent of 1981 Donruss. Collectors purchased complete sets at games or team stores for a few dollars and not many singles reached today's market; most price guides continue to price them only as team sets. Value: This #5 cost $2 at MinorLeagueSingles.com. You can probably charge a Rangers fan something extra, given Ron's success at the helm. Fakes / reprints: Haven't seen any non-star minor league reprints in the marketplace. On September 15, Panini announced a multi-year contract with the MLB Player's Association, the business arm of our pastime's players union. Topps retains exclusive permission to use on-card major league team names and logos, but more competition in a market usually means better options for buyers. Panini's main challenge will be the same faced by other MLBPA licensees: how can we make cards look cool without logos and uniforms? How do we look better than...this? 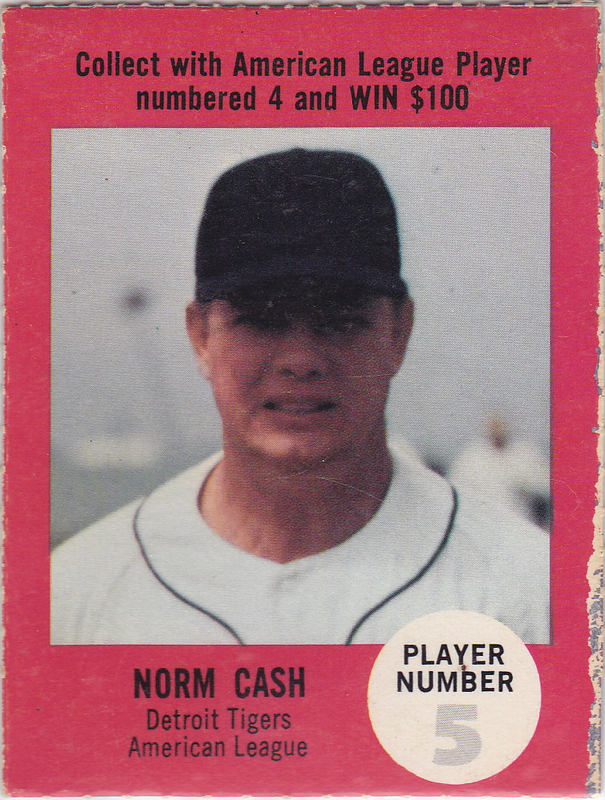 Atlantic Oil blacked out Norm's cap to avoid legal trouble with Topps, who claimed sole right to MLB team logos and cards packaged with gum. Instead of paying their own photographer, Atlantic licensed the photos (sans caps) used by Dexter Press in their 1967 set, which shows an unaltered version. 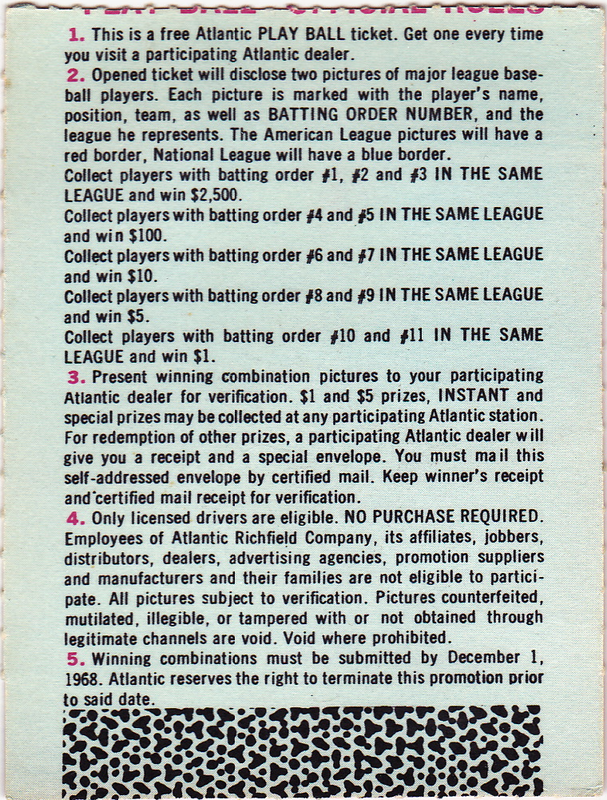 Atlantic put most of their creative energy into laying out the contest rules on card backs. Hard to say how well it turned out, but we know they didn't repeat the promo for 1969. 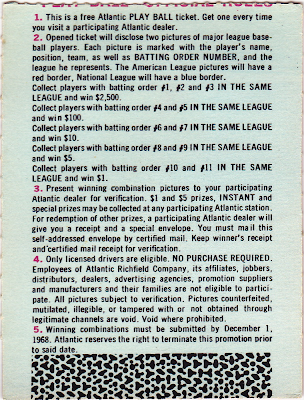 Atlantic Oil printed four different #5s for this contest and Norm's probably the easiest to find. 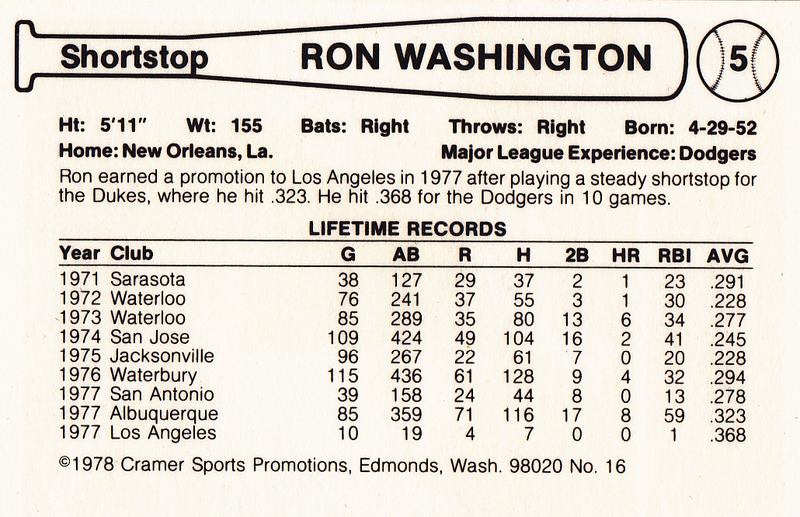 This list links to my other profiles, which I just updated with new front-and-back scans for Yaz and Frank Robinson. Value: Norm cost $3 on eBay, about average for low-grade oddball sets from this era. Fellow #5 Ernie Banks remains a white whale for my type collection, since he was intentionally short-printed for the $100 contest prize and is probably available only at auction. Fakes / reprints: Haven't seen fake Norms in the marketplace, but it's possible for rarities like Banks. Look for the perforated edges, as each player came on a sheet. 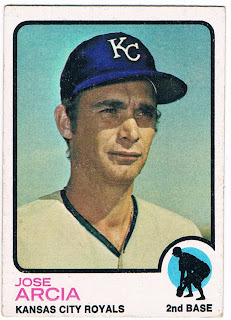 1977 marked the first year Burger King licensed Topps' standard card design, front and back, to support both MLB team promotions and their sponsorship of local Pitch, Hit, and Run events, a baseball skills competition for boys and girls around the country. (It continues to the present day under the banner of Aquafina water.) Only Yankees appeared in this debut year, with 23 numbered players and one unnumbered team checklist for 24 total cards. 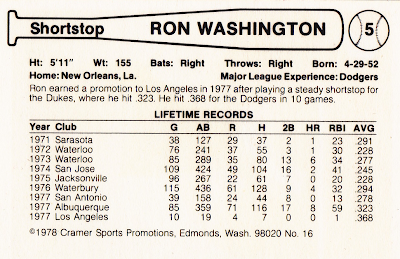 Burger King originally planned a 22-player set, but added Lou Piniella as #23 after their initial run. Why tack on Lou late in the game? Lovers of Steinbrenner drama should read The Curious Case of the 23rd Card in a Series of 22. 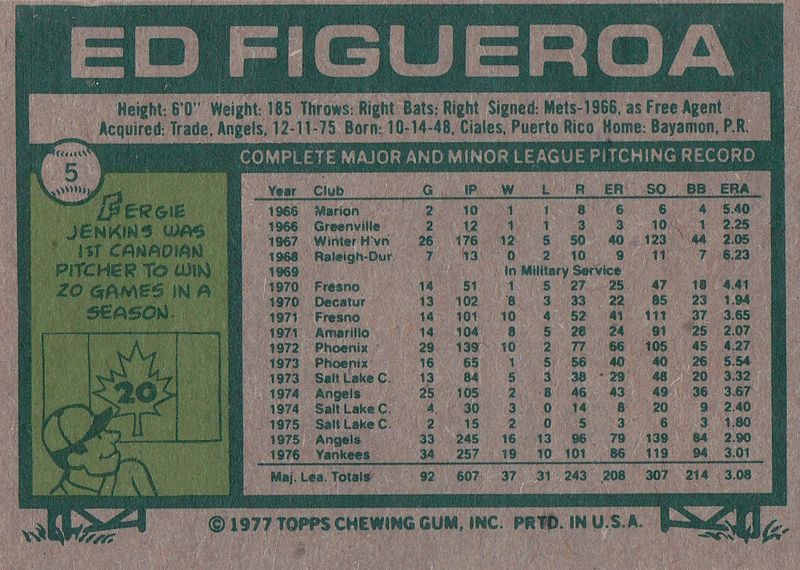 Today's card back taught me something new, that Fergie Jenkins was Canadian. 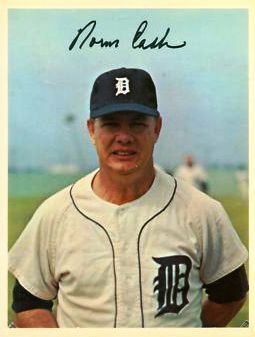 The 284-game-winning HOFer hails from Chatham in southern Ontario and it's kind of a shame he didn't spend time with nearby franchises Toronto (northeast) or Detroit (west). Hometown appeal sells tickets! 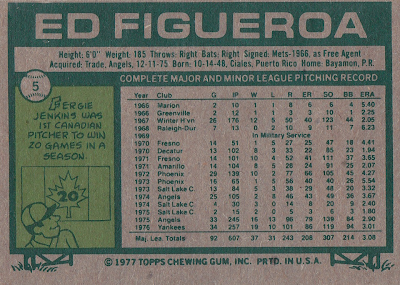 With Figueroa in the books, I've profiled all nine vintage Burger King sets and recently "refreshed" the other eight entries with better scans. (No more french fry stains.) Ed has the distinction of appearing twice, once on today's angled stadium shot and in portrait for 1978. Value: Ed cost $2 at a show in 2006 and probably hasn't changed in value since. #23 Lou Piniella's considered a short-print and runs several times other singles. Fakes / reprints: Don't know of any reprints, but many collectors confuse early Burger King cards with their Topps equivalents, given the lack of a company name or logo. 1977 Topps (and O-Pee-Chee's) normal #5s are the MLB Victory Leaders, Jim Palmer and Randy Jones. 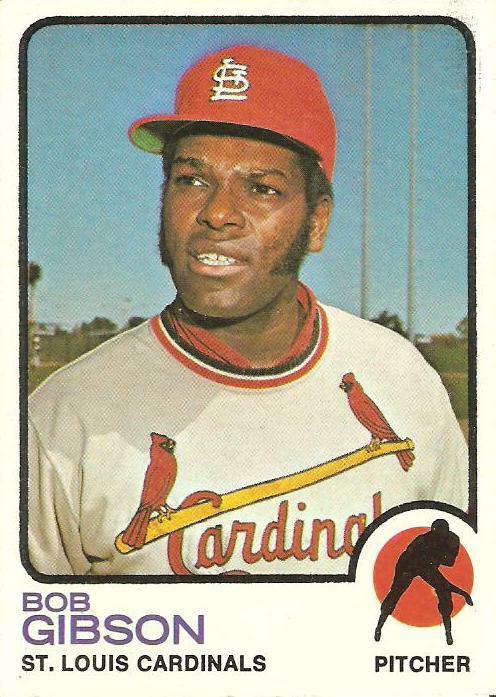 ...and those 5 copies aren't of awesome guys like Bob Gibson. Instead, I've got a fistful of airbrush specials like Jose Arcia. (At least the position backgrounds match their team colors: red for Bob, blue for Jose). TRIVIA: Arcia last played in the bigs as a Padre in 1970, so this is an old picture airbrushed for 1973. He signed a minor league contract that spring with KC and Topps probably thought he'd make their squad, but Jose spent the remainder of his career at AAA and AA (minor league stats). 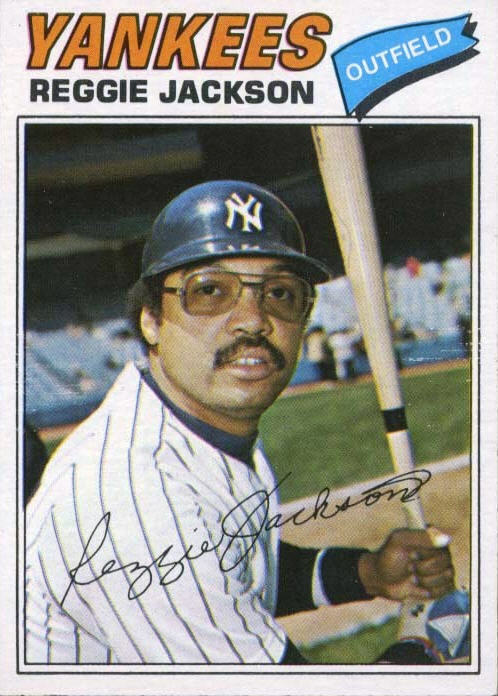 I'd be remiss to not mention 1973 Topps Photography here. It's covering the whole set in full, chain-link-fence glory. 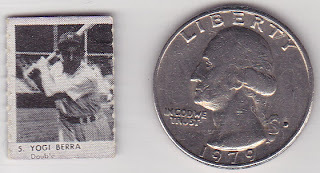 Meet the Eddie Gaedel of Yogi Berras, a baseball card so small that I'm re-evaluating my line between "card" and "chit." That tiny card is just 5/8" x 7/8", even smaller than Topps Micro. Those purple perforated edges bely Yogi's origin as a strip card; R423's intact 13-player strips also came with (common) orange or (rarer) green backs and its checklist mixed current players with long-retired stars like Babe Ruth, Lou Gehrig, and Ty Cobb. Today's R423 set calls back to my recent giveaway, where Mad Guru won this 1948 R346 Johnny Mize in my "favorite card goof" contest. (Guru added personal detail about his winning nomination, 1988 Topps Al Leiter, at Rain of Error). Jefferson Burdick's American Card Catalog prefixed these R346 and R423 sets with "R" for "pre-1951 gum cards" and added a number to further organize them. Based on the catalog's first few hundred entries, Burdick started with an alphabetic system but abandoned it, likely because new set discoveries broke up his existing records. 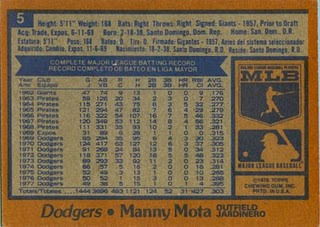 With no company name to ID them, collectors know these two baseball sets best by his catalog numbers. 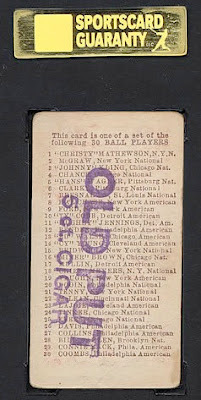 Value: A collector friend from OldBaseball.com sent me this HOF oddball gratis; thanks Mike! Non-HOF singles cost a few dollars in low grade and Berra would go for $15-20. 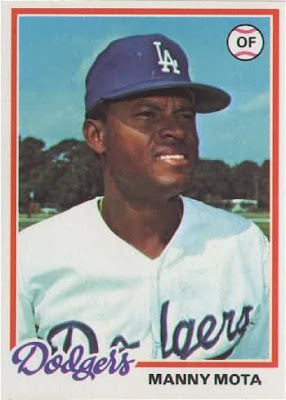 After 30 years of opening packs, ticking off checklists, and stacking stacks of cards on other stack of cards, I can say it's a challenge to find individual players that shine, year after year. 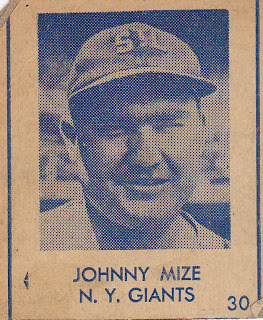 Aside from occasional design standouts like 1956 Topps that made everyone look good (set profile), most sets fit into a narrow design range, where action shots or unusual composition stick with you longer than individual names. Just a few all-timers float to the top: Jackie, Mantle, Ruth, Cobb...and Wagner. 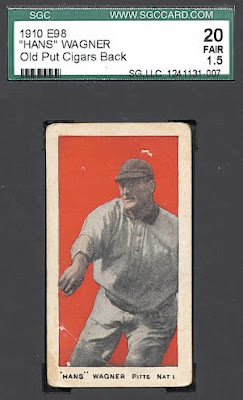 Are names like Cobb, Mathewson, Young, and LaJoie not enough card-buying challenge? Masochistic master set collectors also pursue the colored background variations, a goal that ramps up the significant set cost another several notches. Others go after an interesting E98 version with black and white fronts; the linked Net54 prewar thread discusses their history, which might (or might not) be test sheets discarded prior to adding color. 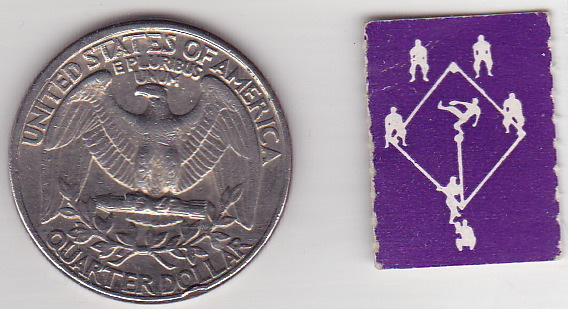 Old Put Cigars provided a small clue to the set's origin with their 5-cent ink stamp shown in the scan below. A small number of E98s include this stamp, which links it somewhat with that cigar brand. Unfortunately, this mark's no guarantee of a tobacco-only release, since prewar printers often sold advertising space on card backs to multiple advertisers. One possibility is that Old Put bought a quantity of cards, added their stamp, and packaged them in cigar boxes. Another is that they provided stamps to local sellers, who added the ink manually when customers bought in-store products. Jefferson Burdick proposed in his American Card Catalog that Boston-based candy maker C. A. Briggs published the E98s, which explains why it succeeded their 1909-1910 E97 Briggs Candy, despite lacking the same "C. A. Briggs Co., Lozenge Makers" tagline. Some of Burdick's classifications later proved too simplistic (such as W516's co-mingling of 3 variations), so until a smoking gun links the "anonymous" set to a product and printer, E98 origins remain enigmatic and open to debate. Fakes / reprints: Full-set reprints exist and people have faked the stars. Given their age and rarity, grading's the most reliable way to give sellers and collectors confidence in an E98's value. Given time, most baseball fans can rattle off all 30 MLB teams by city and name, and probably some former teams besides, such as the Seattle Pilots or Montreal Expos. Minor league teams, on the other hand, prove much more challenging to name, given how much they move around, often changing towns or names multiple times in less than a decade. Smaller fan bases leave most squads sensitive to changing fan interest and only the best-run teams hang around long enough to become known outside their geographic region. Today's card brought the shifting sands of minor league existence to mind when I looked up Tulsa and the history of its AA team, the Drillers, who joined the Texas League the same year MLB added Seattle's Mariners and Toronto's Blue Jays. 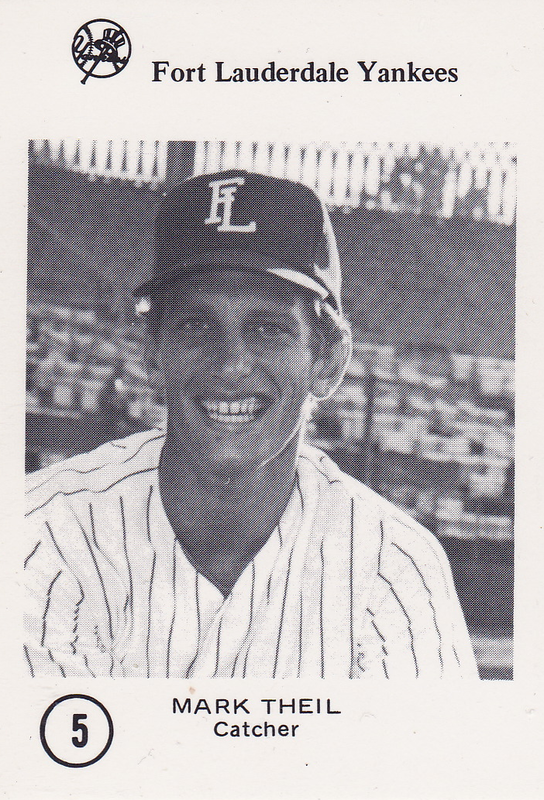 The Drillers played briefly in Lafayette prior to moving to Tulsa, but are one of just two squads to maintain their Texas League town and name in the 35 years since. 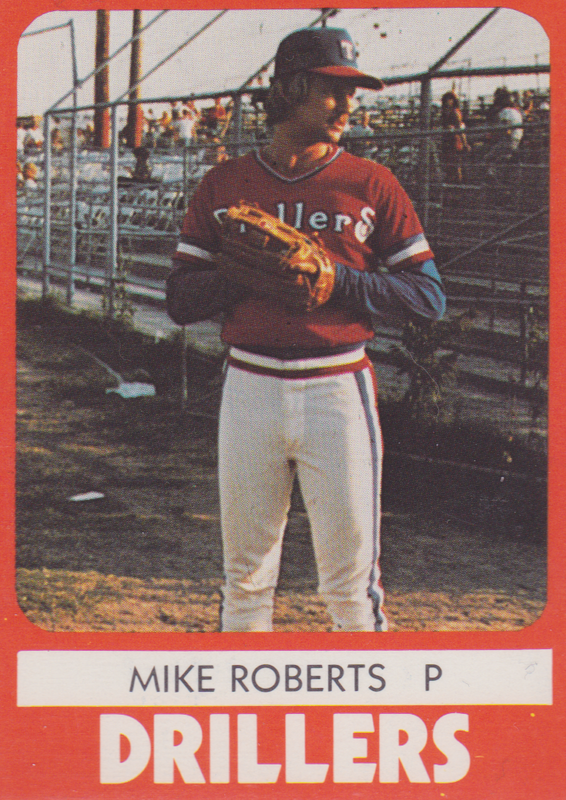 If you've heard "Texas Leaguer" in a baseball context, by the way, that's a weak fly ball (lower than a pop up) that drops between an infielder and an outfielder (also "flare" or "blooper"). 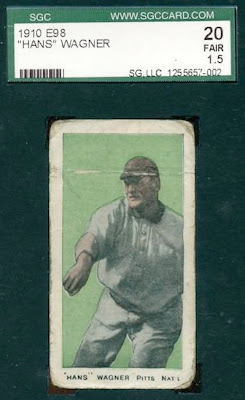 According to Wikipedia, the term originated when Ollie Pickering, a popular Texas League player, made his major league debut and proceeded to run off a string of seven straight bloop hits, to which the game announcers stated, "Well, there goes Pickering with another one of those Texas Leaguers." Hey, is SPORTS BUFF COLLECTION an ad for Tulsa's local sports card shop? It's tempting to think so, but the only Internet reference I found refers to the business as either a "retail sports store" or "scientific and technological services." Maybe they sold cards and maybe they sold computers. Any readers from the Midwest know more about this store? Value: Found this on Beckett Marketplace for $2. Fakes / reprints: Haven't seen any and it'd be tough to make money faking non-star TCMA cards.